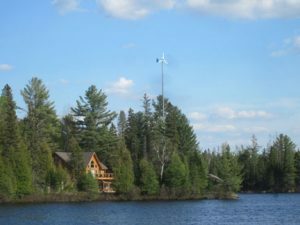 Gallo-Teck is a licensed and fully insured electrical contractor which specializes in renewable energy in and around Bancroft, Ontario. One of the fastest growing energy resources in the world today is wind power—and home as well as commercial property owners now have the opportunity to take advantage of the environmental and cost benefits this form of energy offers. Wind power is not only cost effective, but also highly efficient. 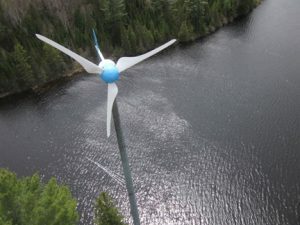 As a leader in renewable energy technologies, Gallo-Teck offers off-the-shelf systems which can be installed yourself or by your contractor, or we can design and install a customized system for you anywhere within a two-hour radius of Bancroft, Ontario (though we will make exceptions depending on the nature of the project and work required). Another benefit to wind power is that it is a clean fuel source. Unlike coal or natural gas, wind power does not produce any harmful atmospheric emissions which can produce hazardous side effects such as greenhouse gases or acid rain. Wind power is a sustainable form of energy. As long as the wind is blowing, even minimally, you will always have a power source to rely on. Gallo-Teck is proud to design, procure, and install custom wind power systems for our customers. From the very first step to designing the right system to meet your electrical needs to turning it on and allowing you to generate your own carbon-free energy, we are there every step of the way. For more information on our wind power solutions or if you need help troubleshooting your existing system, contact us today.